Underfoot is EverQuest's sixteenth expansion. It was announced on July 1, 2009, and will be officially launched on December 15, 2009. 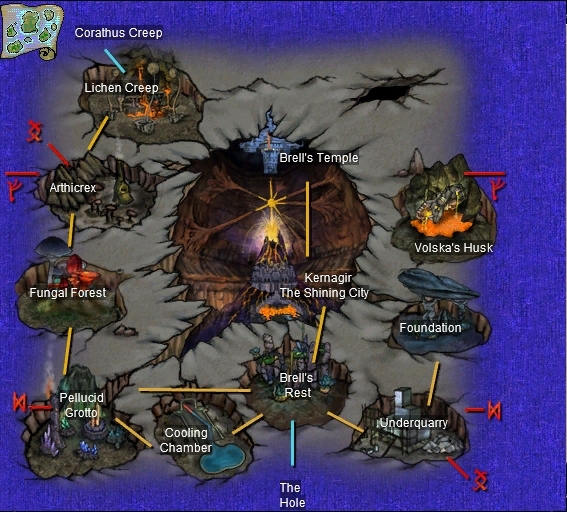 Completion of three "Road to Underfoot" tasks allowed for early access to the expansion beginning on December 8, 2009. The initial announcement may be found here and the early-access expansion release patch message may be found here. Expansion Progression Window – You'll be able to easily see what you have accomplished through Underfoot and which objectives you should achieve in order to travel in your desired progression path. This Achievement System allows you to display and manage your progress through the world of Norrath. Focus Target Window – This new target window will let you add specific targets to your list which will be helpful to monitor the health of Friends or Foe. All Inclusive - The expansion includes all features and content from the 15 previous expansion packs. More Weapon Models - Underfoot will have twice as many weapon models as any of the previous 15 expansions. See this page for a list of zones in Underfoot. The first tier(Tier 6) is a step above Korafax in terms of difficulty. Rank I spells result from group tasks. Rank II spells result from gem trade-ins (details here). Rank III spells are gathered through raiding (details here). You can access Underfoot via the Guild Hall portal or through the Ruins of Old Paineel (The Hole). Once you have Tier 3 access, you can also get to Underfoot through Corathus Creep. This page last modified 2018-08-08 14:55:06.